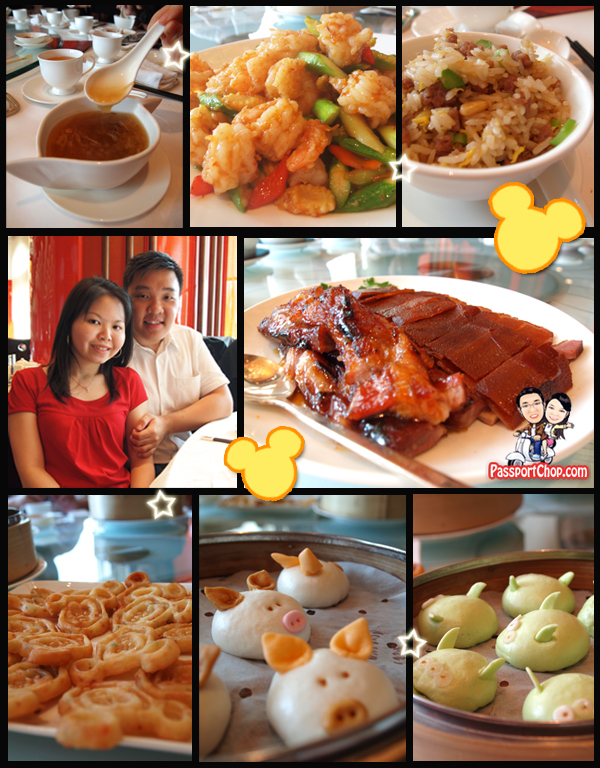 When in Disneyland, it is easy to get immersed into the Disney atmosphere such that you live, breathe, eat Disney – “eat Disney” is pretty much what we did on our first day with a sumptuous lunch Dim-Sum feast on various Disney characters. 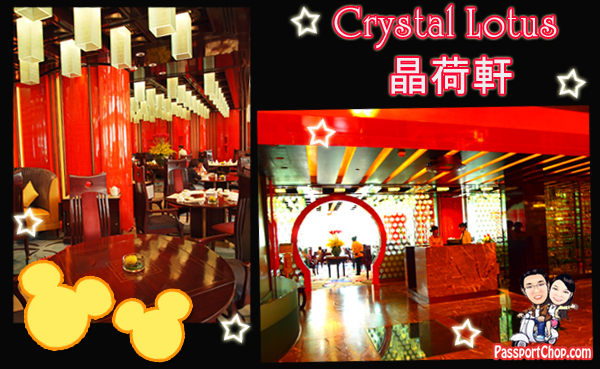 From the outside, the Crystal Lotus Restaurant in Disneyland Hotel looks like a very high-class fine-dining establishment serving only expensive hard-to-pronounce dishes but looks can be deceiving – the chefs are very creative with their presentation and naming of their food. We enjoyed a 6-course lunch set which started off with a BBQ platter – Crispy Suckling Pig with Sweet Sauce, Honey-glazed BBQ Pork Fillet and Crispy Toffee Duck Breast with Garlic Soy Dip. Besides the Winter Melon Soup, King Prawns with Fried Rice, the highlight of the lunch is the Dim Sum Platter. With names such as Three Little Pigs BBQ Pork Bun, Little Green Men Pork and Vegetable Bun and Mickey’s Seafood Pancake and their cute appearance, how can anyone bear to eat them all?! The food looked too cute to eat, especially the Three Little Pigs and the Little Green Men, but they are just as equally yummy! 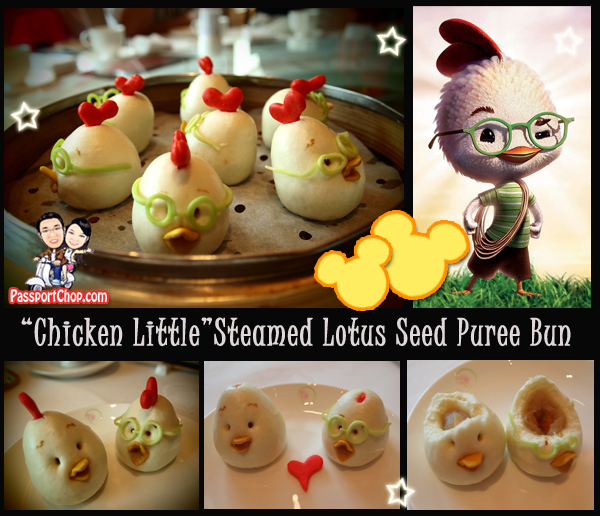 🙂 This Disney character feast didn’t stop here though – for dessert, we had “Chicken Little” Steamed Lotus Seed Puree Bun. I guess the Sky had Fallen for them. 🙂 Before savoring them, we couldn’t resist dissecting them bit by bit to find out what’s inside them – first the spectacle of Chicken Little (which is essentially flour) and then its beak and crown (again, flour). Ha! This gives a new definition to the term “playing with food”! Who knew lunch could be so fun amidst such a high-class dining environment? 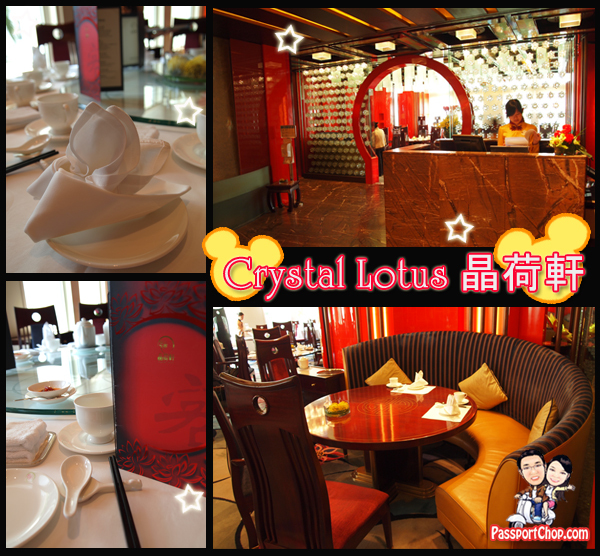 Besides the food and ambiance, the Crystal Lotus Restaurant at Hong Kong Disneyland Hotel is also well-known for its Feng shui – creating harmony by balancing the five elements: earth, fire, water, metal and wood – which is ingeniously incorporated in the Crystal Lotus restaurant, with water and fire represented by brand new innovations developed by Disney Imagineers, including a virtual koi pond – complete with computer-animated fish that scatter when guests walk on the see-through floor – and hot fire special effects behind the bar. OMG! The buns are hilarious and so creative! Hahahaha! I gotta make a trip there for the food. .-= Esther´s last blog ..Lenscape #7 =-. Hi, wanted to ask. Are those dim sums only available during weekends? think they r available daily.